Stanley D. Embick was born on January 22, 1877, in Greencastle, Pennsylvania. 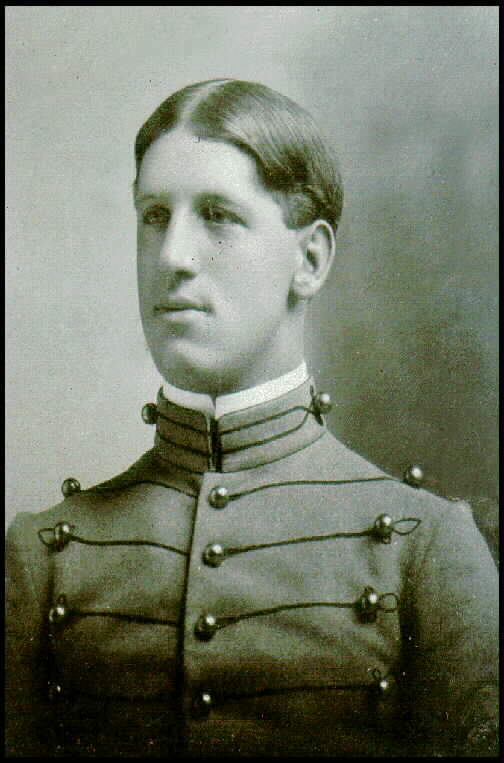 Upon graduation from the U.S. Military Academy in 1899, he was commissioned a Second Lieutenant in the Artillery and served with the 2nd Artillery in Cuba during the Spanish American War. 2LT Embick arrived at Fort McPherson with Battery B, of the 2nd Artillery, which he commanded from his arrival until his departure on 31 January 1900. During this brief period, he also served as the Post Adjutant since there was a shortage of officers on post. From 1902 to 1903 he was assigned to the Coast Artillery School in Fort Montroe, Virginia. From 1905 to 1911 he served as Assistant to the Chief of Artillery in Washington, D.C. From 1912 to 1914 he was assigned to Fort Hamilton, New York. In January 1918 he went to France as a Colonel in the Signal Corps and served as Chief of Staff of the American Section of the Supreme War Council. He was awarded the Distinguished Service Medal for solving many complex problems that came before the council during the war. He also served on the American Peace Commission. In December 1919 he was assigned to the War Plans Division, War Dept. General Staff in Washington, D.C. In 1920 he went to the Army War College where he graduated and remained as an instructor. His next overseas assignment was to the Phillipines in 1923. This was followed by another assignment to the War Plans Division as Executive Officer. He returned to Fort McPherson in October 1938 as a Major General in command of the Third Army with responsibility over both the VIII and IV Corps Areas. He retired on 27 September 1940 as a veteran of more than 45 years of Army service. Born in 1877, he was an important military planner. He served as Chief of Staff of the United States Section of the Supreme War Council in 1917 and as a delegate to the Versailles peace conference. He attained the rank of Lieutenant General in 1939, when he was appointed Chief of the War Plans Division. In that office, he played an important part in developing the early strategy in the Pacific during World War II. His conservative policy emphasized the necessity of holding strategic triangle of Alaska, Hawaii and Panama. With Admiral James O. Richardson, he devised War Plan Orange for early Pacific campaigns and later server on the Joint Survey Committee. He was the father-in-law of General Albert Coady Wedemeyer. 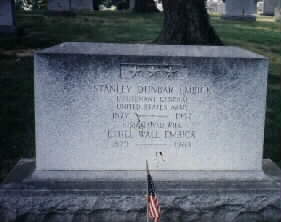 He died in 1957 and was buried in Section 30 of Arlington National Cemetery. 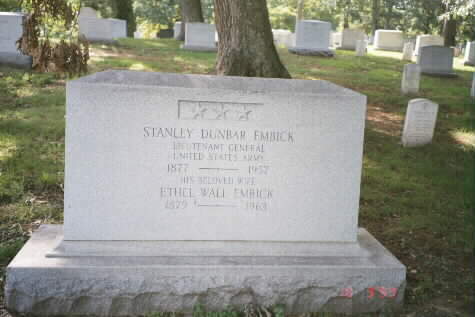 His wife, Ethel Wall Embick (1879-1963) is buried with him. 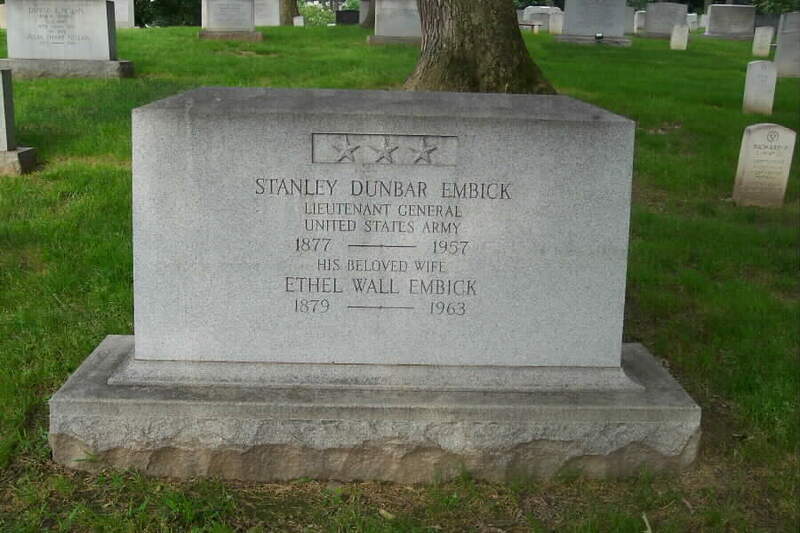 Stanley Dunar Embick, from Pennsylvania, attended several Artillery schools after graduation from the United States Military Academy in 1899 and was the honor graduate of the Coast Artillery School as well as an early member of the War Department General Staff. Embick excelled as an officer. He served as an instructor at the Army War College, with the War Plans Division of the War Department General Staff during WWI, and as Commandant of the Coast Artillery School and the 3rd Coast Artillery District. By 1941, he was promoted to Lieutenant Colonel and was headed for retirement. Embick was recalled to active duty at the start of WWII and was the senior War Department Member of the Joint Defense Board, Canada - United States. After the reorganization of the War Department in 1942, Embick was the designated senior War Department Member and Chairman of the Joint Strategic Survey Committee. This was the same year that the Joint Chiefs of Staff was created. He was promoted to Lieutenant General in 1946 and retired soon after. He received the Distinguished Service Medal, his second award, for his outstanding service. Embick died in 1957 at age 80 at Walter Reed Army Hospital in Washington, D.C.